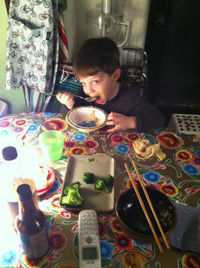 02.16.12 Mommy wants tofu. Go play. Aaron’s off-site again this weekend (bachelor party, not work, for a nice change). Leo and I decided to spend Saturday morning in our PJs, playing downstairs with the neighbors, then finally putting on party clothes after lunch; the first of Leo’s school pals, twin girls, turned four today, and much merriness was made. We got home to the quiet house and for a half hour, I washed things. I mean, Leo did some stamp work, followed by some painting. His fingertips are still colorful even after a bath. Then I encouraged Leo to play by himself while I worked on dinner. This is something I think about. Because there are two ways to look at it. One is like this: “not now honey, mommy’s busy, I’m just washing the veggies, then I can play, one more minute, sorry sweetie, not yet, you’re being very patient…” The other way to look at it may well be about the fact that I am an only child. Not a perfect experience, and probably the source of many of my imperfections. But I remember amusing myself at the kitchen table with art supplies, or on the floor of the playroom next to the kitchen with a microscope, or giftwrap-wallpapering my dollhouse, while my mom listened to All Things Considered and made dinner. I really remember it. Like every night remember it. But truly, I think the result of my encouraging Leo to play by himself while I cook dinner justifies the instinct I have to do so. When he settles on arranging animal cards across the living room floor, after announcing he was going to play with his (my old) dollhouse, then finding his pipe cleaners and requiring multiple interventions as he jumped around in frustration trying to attach hearts and circles in a certain way and then MAKE THEM STAY! Which was preceded by him faux-whimpering about wanting to watch TV (the answer, though it would have been convenient for my cooking, was a firm NO. He already watched an hour of Sesame Street with the neighbors this morning. Whine, fuss or accept, the answer remains nope). Which was preceded by him getting very annoyed by my music and insisting he needed to hear the Beatles. Which was preceded by him needing a snack and then finding the proffered broccoli stems unsuitable, ditto the pretzels and banana and finally demanding a cucumber, only to eat most of the broccoli while I peeled it. You get the picture. So when finally there are melodic, self-sufficient playing sounds in the background and I can focus on dinner, I am justifying the whole thing to myself, thinking that he’s been playing at a height of intensity with other kids all day, we’re both tired, and really he needs this. You have to teach kids how to do things, and believe that they can learn, and learning to play happily on one’s own is no exception. And it means that I can make dinner. Mostly just for me. I had put up brown rice in the trusty rice cooker before we left for the party, Leo ate his vegetable course as an hors d’ouevre, and this is the night he’ll have our old standby, rice and a fried egg, drizzled with sesame oil and soy sauce. Me, I want health food. Slash take-out. So I defrost a little of my frozen chicken stock to create a savory brown garlic sauce for tofu and spinach that completely fills the bill. It’s funny how selfish I sometimes feel for trying to, say, carve out time to shower when my kid seems to need me. Then, times like tonight, telling Leo to amuse himself so that I can spend 20 minutes humming along to the Beatles while making a stir-fry for one feels like the most harmonious thing to do.